Explanation: As northern hemisphere nights grow longer, October is a good month for spotting aurorae, or even other eerie apparitions after dark. And this week the night sky did not disappoint. On October 24th a solar coronal mass ejection impacted planet Earth's magnetosphere triggering far ranging auroral displays. 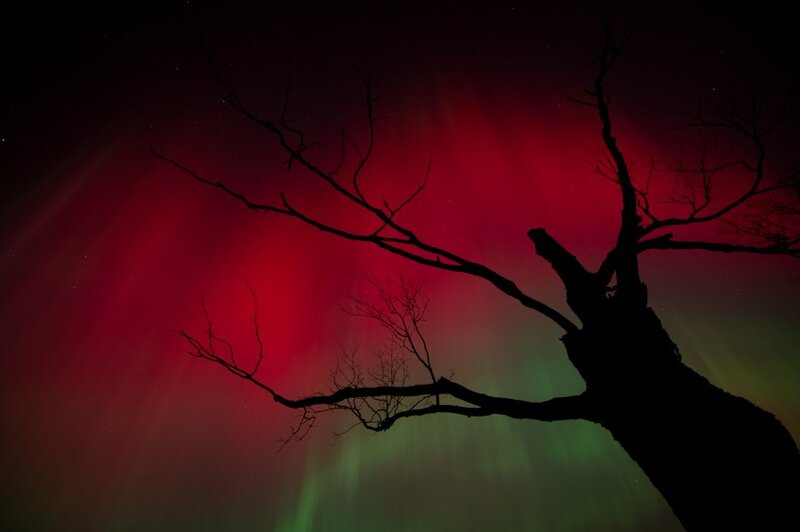 On that night, this dramatic silhouette against deep red and beautiful green curtains of shimmering light was captured near Whitby, Ontario, Canada. But aurorae were reported even farther south, in US states like Alabama, Kansas, and Oklahoma at latitudes rarely haunted by the northern lights. Well above 100 kilometres, at the highest altitudes infused by the auroral glow, the red colour comes from the excitation of oxygen atoms.